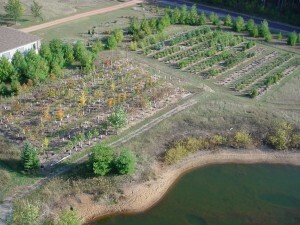 Eco-Building & Forestry, LLC., maintains a Wisconsin Licensed Nursery in Portage County to grow the desired plants that we use daily in our projects. We have the same philosophy on our property that we have for our customers in growing plants in an environmentally responsible way. Birds, bees, snakes, frogs, toads, butterflies and other insects live in harmony in our nursery, but we eat the rabbits! All our trees and most of our shrubs are grown in root control bags which makes our high quality plants manageable and easier to transplant into your landscape. We carry a wide variety of plants: Evergreen, deciduous, perennial, shrub, tree, native, natural, traditional and formal, we have plants to fit any lifestyle or landscaping plan. Although the intent of our nursery is to supply our landscaping customers with eco-friendly plants grown right here in Central Wisconsin, we offer private sales by appointment. Call (715) 344-2817 to schedule your nursery visit. If you’re having a hard time finding that special plant to accent your landscaping needs, Eco-Building and Forestry offers delivery throughout Wisconsin and the mid-west. For our customers in Central Wisconsin we offer “purchase with delivery” pricing for our trees, shrubs and perennials. Please call (715) 344-2817 for inventory and pricing.